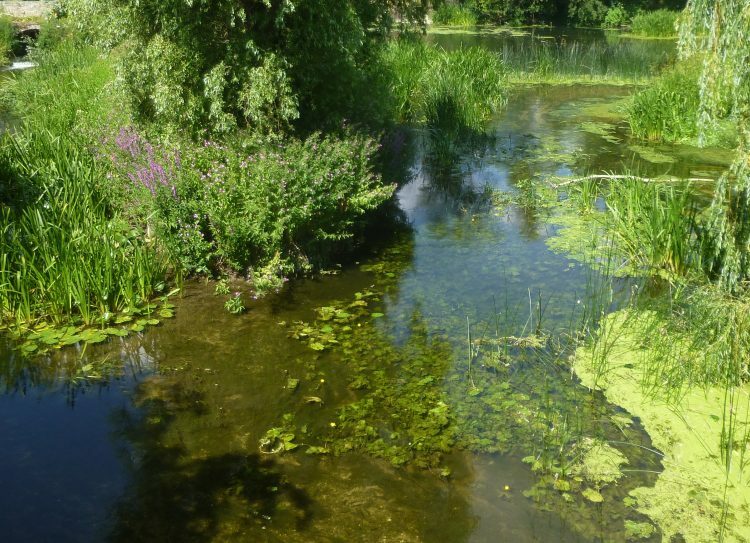 It was very hot this morning, but it seemed like a good day to do my next visit to the River Stour. I’m a bit behind with this project. I’ve still got my late Spring painting to do, which will be of Stratford St Mary, but the most important thing is to keep doing the visits, getting the drawings and photos, at the right time. And now it is quite definitely summer – in fact the summer is flying by! – so I need to prepare for some summer paintings. First I went to Higham. Studying the footpath map before I went it seemed unlikely that I was going to be able to get down to the banks of the Stour, but Higham is at the confluence of the Stour and the Brett, so it seemed quite important to include this stretch. The Brett is the first significant tributary. After a bit of wandering about I found the right footpath – a metal kissing gate off the track by the church, which led into a field. There was a clear track down the field edge, and no fierce cows to be seen. So I set off. A short walk brought me up to the banks of the River Brett, with the Stour valley laid out on the other side of the river. The willow trees marking the course of the bigger river. 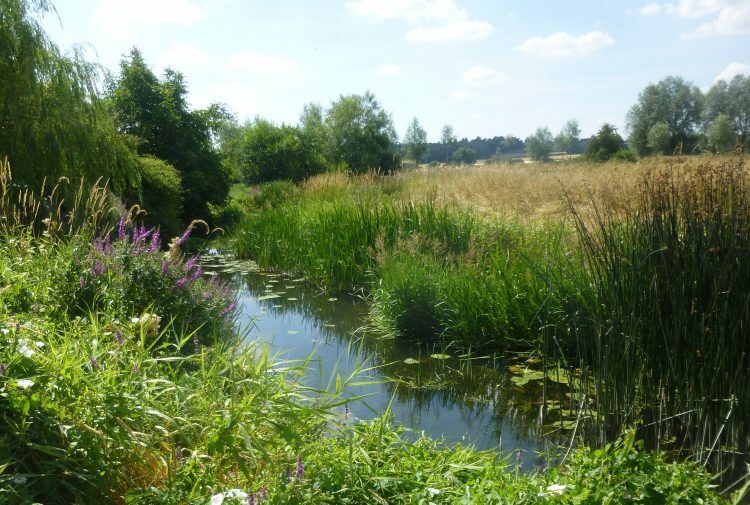 The Stour valley is very pretty, along this stretch, don’t you think? Just as I came up to the bank there was a loud plop! – and circles spread out in the water. I’d love to know which riverbank animal jumped in! I did some drawing and took a few photos, and then it was on to my next stop. This was Boxted Mill. Not originally on my list of visits, but it seemed a likely kind of place on the map. The river is wide here, and the weir, which I presume fed the mill race, is still in place. The roar of the water flowing down stream was audible as soon as I got near the bridge. Hm, yes, the bridge . . . It’s very narrow, and on a nasty bend with a T-junction straight afterwards, so rather a tricky place to stand. My next Stour visit, which I plan to do in about another week, is Nayland. And I have my eye on that lovely bridge by the Anchor pub.